An Associated Press photo of Facebook CEO Mark Zuckerberg's notes reveal he was prepared for senators to ask him about resigning from his company at a joint hearing of the Commerce and Judiciary committees Tuesday afternoon. "I made mistakes," the note said, under a bullet point labeled "Resign?" "Big challenge, but we've solved problems before, going to solve this one." Zuckerberg, who co-founded Facebook in 2004 while in college, appeared at the hearing to address concerns about alleged user privacy breaches, fake news and the alleged manipulation of the platform by a foreign adversary to spread disinformation during the 2016 presidential campaign. Una foto de Associated Press de las notas del Presidente de Facebook, Mark Zuckerberg, revela que estaba preparado para que los senadores le preguntaran sobre renunciar a su compañía en una audiencia conjunta de los comités de Comercio y Justicia el martes por la tarde. "Cometí errores", decía la nota, bajo un punto con la etiqueta "¿Renuncia?" "Gran desafío, pero hemos resuelto problemas antes, vamos a resolver este". Zuckerberg, cofundador de Facebook en 2004 cuando estaba en la universidad, compareció en la audiencia para abordar las preocupaciones sobre presuntas violaciones de privacidad de los usuarios, noticias falsas y la presunta manipulación de la plataforma por un adversario extranjero para difundir la desinformación durante la campaña presidencial de 2016. His notes, which the AP said were "briefly visible" to one of its photographers, include bulleted lists with headings such as "accountability," "data security," "election integrity (Russia)" and "Defend Facebook." "I use FB every day, so does my family, invest a lot in security," the notes said in the "data security" section. The notes included a section on Apple CEO Tim Cook as well. "Lots of stories about apps misusing Apple data, never seen Apple notify people," the notes read. When Cook was asked in a recent interview with Recode about what he would do if in a position similar to Zuckerberg, he replied, “I wouldn’t be in this situation." Though several of the prepared defenses in the notes were used by Zuckerberg during Tuesday's Senate hearing, some never came up. Under the heading "Defend Facebook" were the words, "If attacked: Respectfully, I reject that. Not who we are." Sus notas, que según la AP fueron "brevemente visibles" para uno de sus fotógrafos, incluyen listas con viñetas con títulos como "responsabilidad", "seguridad de datos", "integridad electoral (Rusia)" y "Defender Facebook". "Uso FB todos los días, mi familia también invierte mucho en seguridad", indicaron las notas en la sección de "seguridad de datos".Las notas también incluyen una sección sobre el CEO de Apple, Tim Cook. "Muchas historias sobre aplicaciones que usan mal los datos de Apple, Apple nunca vio notificar a las personas", dicen las notas. Cuando se le preguntó a Cook en una entrevista reciente con Recode sobre lo que haría si estuviera en una posición similar a la de Zuckerberg, respondió: "No estaría en esta situación".Aunque varias de las defensas preparadas en las notas fueron utilizadas por Zuckerberg durante la audiencia del Senado del martes, algunas nunca surgieron.Bajo el encabezado "Defender Facebook" estaban las palabras, "Si se ataca: Respetuosamente, lo rechazo. No somos lo que somos". An Associated Press photo of Facebook CEO Mark Zuckerberg's notes reveal he was prepared for senators to ask him about resigning from his company at a joint hearing of the Commerce and Judiciary committees Tuesday afternoon. "I made mistakes," the note said, under a bullet point labeled "Resign?" "Big challenge, but we've solved problems before, going to solve this one." Zuckerberg, who co-founded Facebook in 2004 while in college, appeared at the hearing to address concerns about alleged user privacy breaches, fake news and the alleged manipulation of the platform by a foreign adversary to spread disinformation during the 2016 presidential campaign. His notes, which the AP said were "briefly visible" to one of its photographers, include bulleted lists with headings such as "accountability," "data security," "election integrity (Russia)" and "Defend Facebook." "I use FB every day, so does my family, invest a lot in security," the notes said in the "data security" section. The notes included a section on Apple CEO Tim Cook as well. "Lots of stories about apps misusing Apple data, never seen Apple notify people," the notes read. When Cook was asked in a recent interview with Recode about what he would do if in a position similar to Zuckerberg, he replied, “I wouldn’t be in this situation." Though several of the prepared defenses in the notes were used by Zuckerberg during Tuesday's Senate hearing, some never came up. Under the heading "Defend Facebook" were the words, "If attacked: Respectfully, I reject that. Not who we are." Definitions of An Associated Press photo of Facebook CEO Mark Zuckerberg's notes reveal he was prepared for senators to ask him about resigning from his company at a joint hearing of the Commerce and Judiciary committees Tuesday afternoon. "I made mistakes," the note said, under a bullet point labeled "Resign?" "Big challenge, but we've solved problems before, going to solve this one." 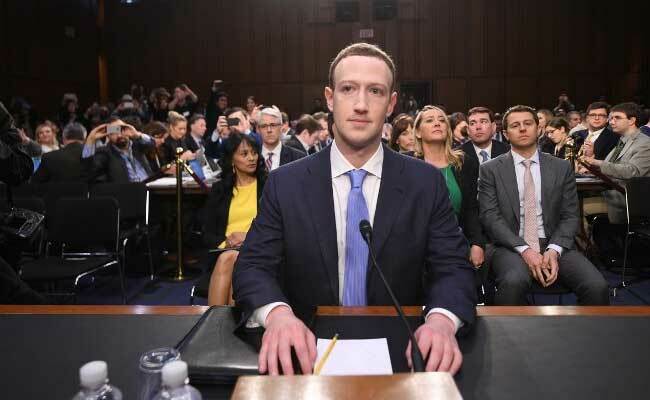 Zuckerberg, who co-founded Facebook in 2004 while in college, appeared at the hearing to address concerns about alleged user privacy breaches, fake news and the alleged manipulation of the platform by a foreign adversary to spread disinformation during the 2016 presidential campaign. His notes, which the AP said were "briefly visible" to one of its photographers, include bulleted lists with headings such as "accountability," "data security," "election integrity (Russia)" and "Defend Facebook." "I use FB every day, so does my family, invest a lot in security," the notes said in the "data security" section. The notes included a section on Apple CEO Tim Cook as well. "Lots of stories about apps misusing Apple data, never seen Apple notify people," the notes read. When Cook was asked in a recent interview with Recode about what he would do if in a position similar to Zuckerberg, he replied, “I wouldn’t be in this situation." Though several of the prepared defenses in the notes were used by Zuckerberg during Tuesday's Senate hearing, some never came up. Under the heading "Defend Facebook" were the words, "If attacked: Respectfully, I reject that. Not who we are." Synonyms of An Associated Press photo of Facebook CEO Mark Zuckerberg's notes reveal he was prepared for senators to ask him about resigning from his company at a joint hearing of the Commerce and Judiciary committees Tuesday afternoon. "I made mistakes," the note said, under a bullet point labeled "Resign?" "Big challenge, but we've solved problems before, going to solve this one." Zuckerberg, who co-founded Facebook in 2004 while in college, appeared at the hearing to address concerns about alleged user privacy breaches, fake news and the alleged manipulation of the platform by a foreign adversary to spread disinformation during the 2016 presidential campaign. His notes, which the AP said were "briefly visible" to one of its photographers, include bulleted lists with headings such as "accountability," "data security," "election integrity (Russia)" and "Defend Facebook." "I use FB every day, so does my family, invest a lot in security," the notes said in the "data security" section. The notes included a section on Apple CEO Tim Cook as well. "Lots of stories about apps misusing Apple data, never seen Apple notify people," the notes read. When Cook was asked in a recent interview with Recode about what he would do if in a position similar to Zuckerberg, he replied, “I wouldn’t be in this situation." Though several of the prepared defenses in the notes were used by Zuckerberg during Tuesday's Senate hearing, some never came up. Under the heading "Defend Facebook" were the words, "If attacked: Respectfully, I reject that. Not who we are." Examples of An Associated Press photo of Facebook CEO Mark Zuckerberg's notes reveal he was prepared for senators to ask him about resigning from his company at a joint hearing of the Commerce and Judiciary committees Tuesday afternoon. "I made mistakes," the note said, under a bullet point labeled "Resign?" "Big challenge, but we've solved problems before, going to solve this one." Zuckerberg, who co-founded Facebook in 2004 while in college, appeared at the hearing to address concerns about alleged user privacy breaches, fake news and the alleged manipulation of the platform by a foreign adversary to spread disinformation during the 2016 presidential campaign. His notes, which the AP said were "briefly visible" to one of its photographers, include bulleted lists with headings such as "accountability," "data security," "election integrity (Russia)" and "Defend Facebook." "I use FB every day, so does my family, invest a lot in security," the notes said in the "data security" section. The notes included a section on Apple CEO Tim Cook as well. "Lots of stories about apps misusing Apple data, never seen Apple notify people," the notes read. When Cook was asked in a recent interview with Recode about what he would do if in a position similar to Zuckerberg, he replied, “I wouldn’t be in this situation." Though several of the prepared defenses in the notes were used by Zuckerberg during Tuesday's Senate hearing, some never came up. Under the heading "Defend Facebook" were the words, "If attacked: Respectfully, I reject that. Not who we are." Translations of An Associated Press photo of Facebook CEO Mark Zuckerberg's notes reveal he was prepared for senators to ask him about resigning from his company at a joint hearing of the Commerce and Judiciary committees Tuesday afternoon. "I made mistakes," the note said, under a bullet point labeled "Resign?" "Big challenge, but we've solved problems before, going to solve this one." Zuckerberg, who co-founded Facebook in 2004 while in college, appeared at the hearing to address concerns about alleged user privacy breaches, fake news and the alleged manipulation of the platform by a foreign adversary to spread disinformation during the 2016 presidential campaign. His notes, which the AP said were "briefly visible" to one of its photographers, include bulleted lists with headings such as "accountability," "data security," "election integrity (Russia)" and "Defend Facebook." "I use FB every day, so does my family, invest a lot in security," the notes said in the "data security" section. The notes included a section on Apple CEO Tim Cook as well. "Lots of stories about apps misusing Apple data, never seen Apple notify people," the notes read. When Cook was asked in a recent interview with Recode about what he would do if in a position similar to Zuckerberg, he replied, “I wouldn’t be in this situation." Though several of the prepared defenses in the notes were used by Zuckerberg during Tuesday's Senate hearing, some never came up. Under the heading "Defend Facebook" were the words, "If attacked: Respectfully, I reject that. Not who we are."